It’s amazing Facebook as updated their features and it getting interesting day by day, Facebook is now playing a big role in our life’s it impressive how you can backup all of your data like photos, videos posts, and other things you’ve contributed to years back, so many memories you don’t want to lose. In case your Facebook got hacked and you are unable to get it back your memories are saved with you. In this tutorial, I will show you how to backup your profile the proper way. 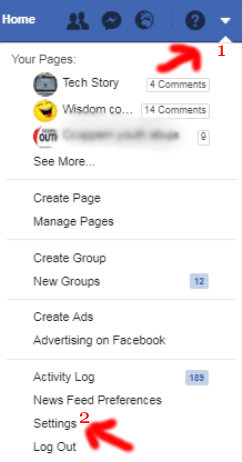 on your settings page click on “General” ( by the left ) at the bottom of the page you will see a text entitled “Download a copy of your Facebook data click on it to launch your backup. facebook automatically prepare archives once it’s ready an email will be sent to you at the address you provided earlier with a link that says “Confirm your Password” sometimes your download starts immediately without waiting for a mail to be sent, it may take time if you have more posts and engagement. See How To Hide Files On Smartphones. I never knew of this. I know a lot of people will find this helpful!! okay its really awesome that i can backup my facebook details, but how about if the account is locked, can i open a new facebook and upload my details back? I didn't know that I could back up my Facebook account. This is amazing. But I think that they should improve it to the level of WhatsApp. Where you can be able to back it up daily and automatically to an email account. Great article.